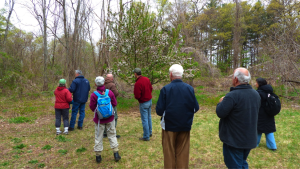 My husband and I joined Pete Costello and six other birders on a cool Saturday morning in May to bird watch. 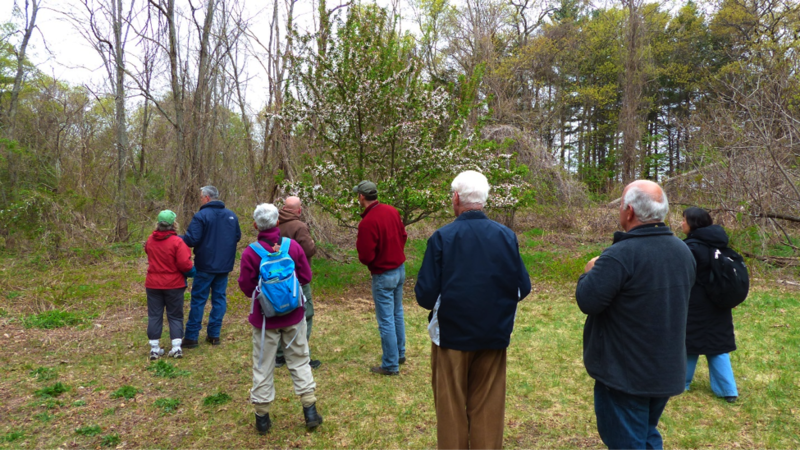 Pete has been leading birding trips in the Greenwood Park area on Saturday mornings during spring migration. We had a delightful morning watching and listening to birds. Since retiring I have become a warbler junkie. These birds are my favorite spring migrants. I call them ‘little jewels’. They are painted beautiful colors and have exquisite markings. You look up in the trees and see brilliant yellow: yellow rumps, orange and black throats, gold colored caps, streaks on the breast and chestnut sides. They are a feast for the eyes. But is doesn’t stop there; these little guys also have beautiful songs. Beauty and song aren’t the only things that attract me to watching these birds. They also put on a wonderful display hopping from branch to branch, flying out catching insects in flight. It is a wonderful dance to watch. Pete was willing to take us to his “secret spot”. No, he didn’t ask us to put on blindfolds and we didn’t take an oath not to tell anyone. He enjoyed sharing his spot with others who share his love for birdwatching. 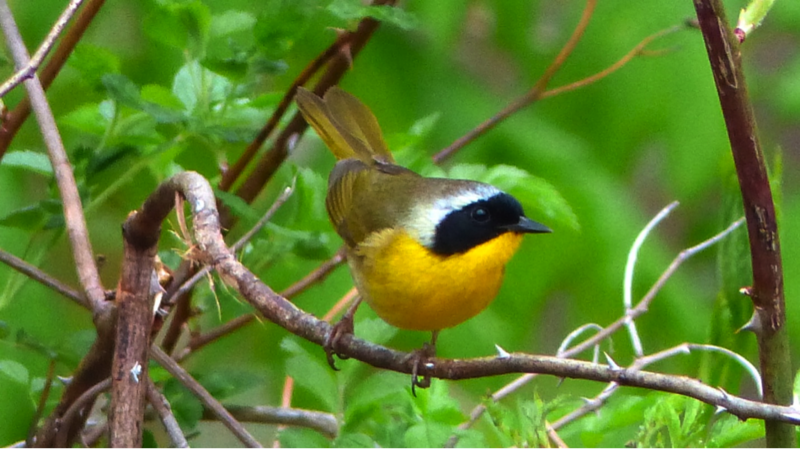 On this morning we were treated to several warblers: yellow warbler, black and white warbler, northern parula, yellow rump warbler, black throated green and a common yellow throat. Another treat was a pair of rose breasted grosbeaks. We watched the female building a nest. We were serenaded by Baltimore orioles. Their brilliant orange is an eye catcher. Get out your binoculars and enjoy the parade of gems in the Fells. If you don’t have binoculars, don’t fret. You will still be able to enjoy the birds. 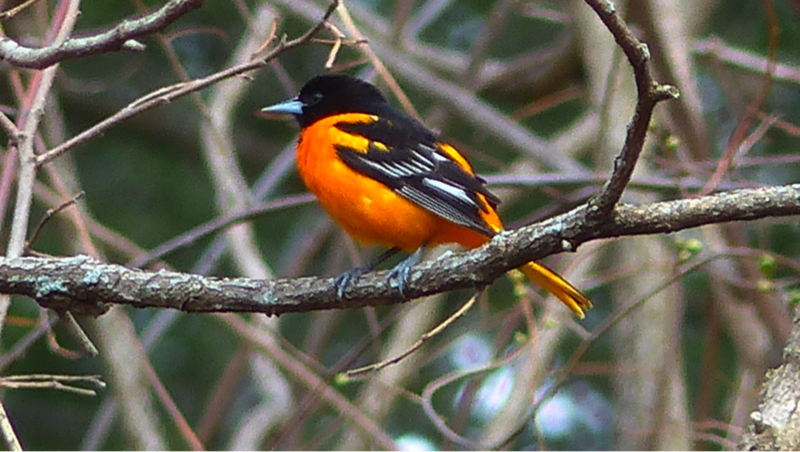 The orioles this time of year are plentiful and put on lively displays. You can’t miss their brilliant orange. You can also watch the warblers doing their acrobatics in the trees. 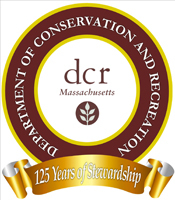 There are many great places to bird in the Fells: Long Pond, Wrights Pond, High Service Reservoirs, the shore of Spot Pond, and Virginia Woods. Pete has a wonderful approach to birdwatching. He moves quietly through the woods, frequently stops to watch and listen, and will stay in one spot to watch and wait to see who visits. 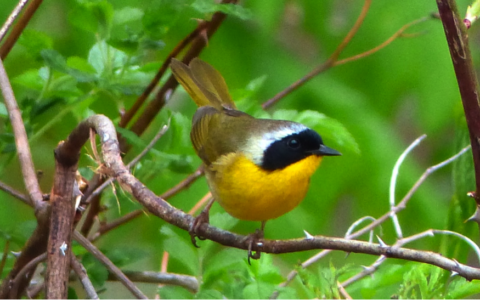 People new to birding to seasoned birders are welcomed on his trips.